The life of True W. Williams spanned a period of fifty-eight years from 1839-1897. One of Mark Twain's most prominent illustrators, Williams led a life that is bound together with the works of Twain and also with the publishing empire of one of Twain's most notorious enemies--Alexander Belford, the Canadian publishing "pirate." Throughout his career Williams provided illustrations for books by some America's most popular writers. However, history never conceded to True Williams one recognition that he desired and that Alexander Belford's company offered--to be known as an author in his own right. Frank Fairweather's Fortunes was the title of Williams' own book. Truman W. Williams was born on March 22, 1839, in Allegany County, New York to Asa and Louisa Keelar Williams. The Williams family consisted of at least one other child--a daughter named Rhoda Delana. The family later moved to Jefferson County, known as the "North Country" of New York state, to a small community of Burrville and later into the nearby community of Watertown. According to newspaper clip files in Watertown, Asa Williams was a former overseer of the county roads who went West during the gold rush of 1849 and died in California in a drowning accident. True's mother Louisa and his sister Rhoda remained lifelong residents of Watertown, New York. Rhoda married William Wooster Sherman, the eldest son of prominent Watertown banker. Rhoda later became a director of the local orphanage and a leader in the New York women's suffrage movement. By the time the Civil War broke out, Williams had moved to Illinois. One of his earliest published illustrations that has been found is an illustration titled "Rebel Prisoners at Camp Douglas, Chicago, Illinois" which appeared in Harper's Weekly on April 5, 1862. On December 21, 1863, Williams enlisted on the side of the Union as a Private in Company E of the Illinois Volunteer Infantry. The Muster and Descriptive Rolls of the Illinois Civil War Units describe a twenty-three year old Truman Williams as being 5' 8" with dark hair and hazel eyes. Williams, whose occupation was listed as an engraver, served in detached service as a topographical engineer during General Sherman's march through Georgia. He sustained no battle injuries in the Civil War, but later would claim a life-long battle with painful varicose veins in his legs that arose shortly after the battle of Kennesaw Mountain in Georgia "due to severe marching and hard service while in the military and engineer service. "(2) Williams last saw active duty on September 16, 1865, and was honorably discharged in Springfield, Illinois on October 9, 1865. In 1868, when Elisha Bliss of American Publishing Company obtained a manuscript from a relatively unknown Samuel Clemens for a travel book about a Quaker City excursion, the job of producing the majority of the illustrations for The Innocents Abroad, or The New Pilgrim's Progress was given to True Williams. The pairing of writer and illustrator proved highly successful and critics across the country praised the book and its illustrations. Mark Twain's colleagues Bret Harte, Joaquin Miller, Charles Henry Webb and Dan DeQuille would also publish books utilizing Williams' talents as illustrator. In addition, more Twain books followed including Roughing It and The Gilded Age. Publishing delays forestalled the release of Tom Sawyer in the United States but the volume was published in England in June 1876. This unillustrated version was soon pirated in July by the Canadian firm of the Belford Brothers--Charles, Robert, and Alexander--a firm that would figure prominently in True Williams' later career. Alexander Belford, known as "Aleck" to his friends and associates, was the youngest member and leading force behind the Belford firm. Born in Ireland in 1854, his parents immigrated to America when he was an infant. Orphaned at the age of ten, he--like Sam Clemens--had received little opportunity for formal schooling. At age twelve, Alexander was employed by the Toronto Evening Telegraph where he learned the printing and publishing business--another trait he held in common with a young Sam Clemens who also had been employed in his hometown printing establishments. Alexander's older brother Charles held the position of journalist and editor for the Toronto Leader and later the Toronto Mail. James Clarke, also of Irish descent and born in Canada, joined the Belford publishing firm soon after the Canadian company was established. When the controversy arose over the Canadian Tom Sawyer reprint, Belford asserted that English copyright did not apply in Canada and publishing works by foreign authors without regard to copyright or royalty payments was not illegal on their home soil. Belford Brothers, however, infiltrated the American market with an estimated 100,000 unauthorized copies of Tom Sawyer. Their pirating dashed Clemens' hopes for any substantial profits. Not only were works of Clemens being pirated, but also those of other American authors published by the American Publishing Company including Bret Harte and Marietta Holley, a writer with whom True Williams developed a close friendship. Some called her the female Mark Twain--a feminist who utilized humor and a quirky dialect when she wrote on behalf of women's suffrage, the temperance movement and a host of other women's issues. Holley was born in 1836 in the "North Country" of Jefferson County, New York not far from True Williams' hometown. She was a reclusive farm girl who never married but wrote under the pen name "Josiah Allen's wife." Holley's first book for Elisha Bliss' company in 1872 had been titled My Opinions and Betsey Bobbet's and contained several illustrations True Williams had drawn for previous American Publishing Company volumes including Mark Twain's Roughing It. Holley dismissed Williams' warnings and attributed it to his drinking. Clemens' fears proved correct and Canadian editions rapidly materialized. Two months after A Tramp Abroad was issued, Elisha Bliss retired from American Publishing Company in failing health. Upon his death in September 1880, Frank Bliss assumed control of American Publishing Company. Marietta Holley had just completed her third volume for the Company titled My Wayward Pardner. Williams was sole illustrator. By early 1881, Holley's play titled Betsey Bobbet was being presented in amateur productions in New York. The summer found True Williams in New York acting on Holley's behalf to get her play into production. One of at least two surviving letters written by True Williams to Marietta Holley was written while he was in New York. Dated June 2--no year is given--it was most likely written during this time frame due to the fact that the letter discusses Elisha Bliss' death. I had a sheet of paper before me and somehow your name came into my mind and aimlessly I scribbled it. Would you believe that when Bliss became responsible to you for the Am Pub Co as it were-- above paying his debts he did not own a dollar in the world?-- I am sure that you did not know it because I had many more opportunities than yourself-- being on the filed as it were-- Frank Bliss is worth some money but it will never go where his father's went. He has all of the old gentleman's perniciousness but none of his speculative enterprise. E Bliss Jr had one virtue and it was a cardinal virtue looked at from some standpoints. He never ceased to look after the welfare of his children. I never knew him to spend a cent foolishly ie without considering and considering well-- in my life-- He did not spend as much on himself as many draymen I have known. His salary at the Am Pub Co was at one time $9,000 per year. He dipped into real estate it was the old, old story. He became loaded down with non productive property-- waiting waiting, waiting for a rise experiencing only declinations. Bliss was one of the hardest-working most indefatigible men I ever met-- I am sorry for his family's sake that things turned out so poorly. He left one of the brightest children about six years old that I ever met-- horribly plain but very bright. I enclose you a clipping. Mr. Howells, editor Atlantic Monthly last 20 years, is an acquaintance of mine and there is no doubt that your books would outsell his by subscription so far as to leave him in the shade entirely. His readers are of Beacon St. Boston and the aesthetics of other cities-- he is never heard of among "the many." The exceedingly nice, the aesthetic, the goody goody or the prolix author has no chance at best with the people now-a-days-- I often threaten myself that I will take the first opportunity-- the first opportunity with leisure and write Miss Holley a careful and well considered letter that is considered according to my capabilities-- I'm such a recless scribbler and at the best of "such homily wits." The story of the two women True Williams married appears to lead to a single door. The Hartford census of 1880 lists the Horace Heath family of Hartford residing at the corner of Park and Prospect streets. A family of five--fifty-two year old Horace and his forty-seven year old wife Margery; two teenage daughters, Carrie, fifteen and Rose, thirteen; and two sons, William, twenty, and Dwight, age seven. Although previous city directories listed Horace's occupation as a pen artist, by 1880 he and his twenty year old son William were employed as bookkeepers in the Secretary of State's office. In 1884 True Williams and Carrie left Hartford to make Chicago their home. Williams' career in Chicago led through the doors of major Chicago publishing dynasties of the nineteenth century--Rand, McNally and Company and the former Canadian Belford, Clarke and Company which had relocated from Canada to the United States. Rand, McNally and Company traces its 1856 beginning to a Chicago print shop founded by William Rand, a young printer from Boston who was joined two years later by Andrew McNally, a young Irish immigrant. By 1881 Rand McNally had become the largest mapmaker in the United States and by the year 1888 Rand McNally sales topped $1,000,000. (19) As Andrew McNally's wealth grew he built lavish homes for his family and married children near Lincoln Park in Chicago. Helen, one of McNally's daughters married Alexander Belford. Young Aleck Belford--Canadian pirate--had, in effect, ascended to the top rung of Chicago society and its publishing world. When Charles Belford's health had begun to fail, the Canadian company had gone through several reorganizations which resulted in Alexander Belford and James Clarke relocating the company to Chicago in late 1879 and Robert Belford relocating to New York to manage a branch office. Within a few years, using notorious marketing methods, Belford had established what was said to be the largest publishing firm west of New York. On July 25, 1885, Carrie M. Heath Williams died after being a resident of the state of Illinois a little more than a year. Her attending physician listed the causes of her death as phthisis and premature childbirth. According to Carrie's death certificate, she had suffered from phthisis, also known as consumption or tuberculosis, for a year and a half. Carrie died in Hinsdale, Illinois just outside of Chicago. Williams' premature son Truman Paul did not survive. Carrie and Truman Paul were buried in Torode Cemetery, about five miles northwest of Hinsdale, Illinois. On May 26, 1886, a fire destroyed the Belford, Clarke and Company's Chicago headquarters located in the Adams building at the corner of Wabash and Congress. The Chicago Tribune headline the following day read "A Great Blaze of Books." The newspaper reported that among books lost were 100,000 copies of General Grant's book--a book being published by Mark Twain's Webster and Company publishing house--and reportedly being distributed by R. S. Peale and Company. Whether the Grant volumes were legitimate copies or bogus editions has never been determined. One of Belford's works in progress that had been lost in the fire was the large annual collection of illustrated children's stories and poems. Williams' talents were called into service to help reconstruct Belford's Annual 1886-87. On July 27, 1886, a year and two days after Carrie's death, True Williams and Rose Heath were married in Waukegan, Illinois. Throughout the next several years Williams would illustrate frontispieces for reprinted works by George Eliot and James Fenimore Cooper as well as works by Henry Ward Beecher, John Draper, Mrs. Henry Wood, George Wilbur Peck, Bill Nye, numerous children's volumes edited by Thomas Handford, and travel guides published by Rand McNally. And in an ironic twist of fate several years later, Clemens own publishing firm of Webster and Company was put into the position of requesting permission from Belford to reprint one of Bill Nye's stories when it was selected for inclusion in Mark Twain's Library of Humor. In June 1888 Robert Belford in New York issued the first American edition of Belford's Magazine which was edited by Donn Piatt, a former Washington journalist. Belford's Magazine focused upon political issues of the day and each issue of the magazine contained a complete novel. Authors whose literary contributions appeared in Belford's Magazine during its American run included Henry Watterson, Joaquin Miller, James Redpath, and Walt Whitman. 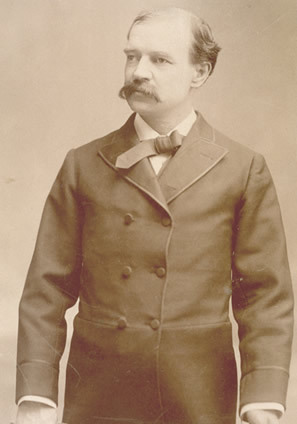 Edward H. House who had been engaged in a bitter lawsuit with Clemens throughout 1890 over play rights to The Prince and the Pauper contributed a portion of his adaptation of that play for the December 1890 issue. Young Albert Bigelow Paine of Fort Scott, Kansas, a writer who would later gain a spot in literary history as Mark Twain's biographer, contributed numerous poems and a short story. Many of the magazine's advertisements were for Belford, Clarke and Company books and True Williams' name appeared frequently as illustrator for numerous volumes. One volume of interest copyrighted by Belford Clarke in 1890 was a book titled Kings of the Platform and Pulpit by Melville De Lancey Landon (Eli Perkins) --a writer whom Clemens detested if we are to judge by Clemens marginalia in one copy of Landon's book that he did own. There's no evidence that he owned this one. The book was a collection of biographies of noted writers and lecturers of the day including Mark Twain. 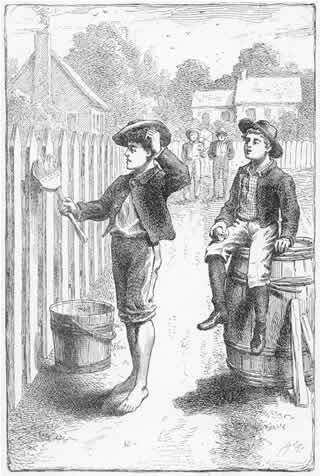 The brief biography of Twain allowed True Williams to submit for literary history a correction of the famous fence whitewashing illustration in Tom Sawyer. Williams' new Tom Sawyer fence for Kings of the Platform and Pulpit is a vertical plank fence. 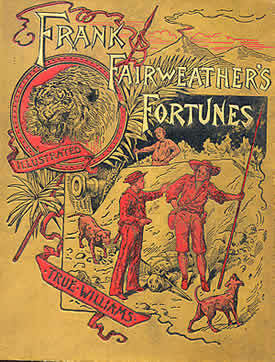 True Williams' own book titled Frank Fairweather's Fortunes was released in time for the Christmas buying season of 1890. Published by Belford, Clarke and Company, the volume received extensive advertising through the spring of 1891 in Belford's Magazine which described Frank Fairweather 's Fortunes as "more entertaining than Robinson Crusoe." Frank Fairweather's Fortunes--a large octavo volume with gold embossed illustrations on the cloth cover--was printed on a heavy weight, smooth finish paper and listed for $2.50 per volume. Williams dedicated Frank Fairweather's Fortunes to his niece Bertha who was Rhoda Williams Sherman's only surviving daughter and acquaintances around Burrville and Watertown believed some of the characters in William's book were based upon people from his old hometown. Frank Fairweather's Fortunes comprises 374 pages and is the greatest body of written material from Williams' own hand that is available for providing any insights into his ability as a creative writer. Partially set in Nicaragua, the book is geared toward the juvenile audience and proves that Williams was an extremely literate and able communicator, well read, and had studied the history and geography of the regions about which he wrote. Under the Open Sky, the second of Williams' literary endeavors, was released simultaneously with Frank Fairweather's Fortunes during the Christmas season of 1890. Both volumes were prominently advertised in Belford's Magazine which described Under the Open Sky as "the most beautiful illustrated holiday gift book of the year." Williams was both editor and illustrator for the volume which contained a lengthy introduction and thirty-six full page illustrations accompanying a collection of Williams' favorite poems and verses relating to the beauty of nature and environment. With the publication of both of his books, True Williams' career had reached its apex. On October 7, 1891, Rose Heath Williams began divorce proceedings against her husband--case number 95996 in the Circuit Court of Cook County in Chicago, Illinois. The court documents paint a bleak picture of the marriage. Although no mention was made of True's previous marriage to Carrie Heath, details from the testimony indicate Rose had moved to Chicago at the same time True and Carrie had relocated to Chicago from Hartford. Rose told the court that immediately after their marriage Williams began the excessive use of liquor and for the previous two years had been an habitual drunk who was quarrelsome and abusive and rendered her life intolerable. Williams did not appear in court to dispute the charges. On January 5, 1892, the divorce decree was entered into public record. The marriage was dissolved and Rose was allowed to resume her maiden name of Rose Heath. The year 1892 also saw the final breakup of Belford, Clarke and Company. Newspaper obituaries written years later at the time of Alexander Belford's death attributed the beginning of Belford, Clarke and Company's failure to the devastating fire which had caused considerable destruction to the Company's office on Wabash street. Other historians attribute the company's financial failure to their reckless wildcat price competition. The International Copyright Act of March 1891 that went into effect on July 1, 1891, brought an end to such reprint price wars. By December 1892 the R. S. Peale Company (formerly identified as the Western agents for General Grant's book) and the Werner Printing and Lithographing Company had consolidated and absorbed the encyclopedia publications and subscription books of Belford, Clarke and Company. Alexander Belford, the second largest stockholder in the Werner publishing conglomerate, was enlisted as vice president and general manager of the publishing department of the realigned Werner Company with assets estimated to be $3,500,000. Belford's office address for the next several years was listed at 160 Adams Street--the same street address as the Rand McNally building. While Chicago was celebrating the opening of the Columbian Exposition in May 1893, Williams was also fighting a bureaucratic battle to obtain financial assistance from the federal government in the form of a Civil War veterans' pension. On May 20, 1893, Williams' chambermaid Jemima Scott submitted a sworn affidavit on his behalf stating that she had known him for over a year and was in charge of doing his cleaning and laundry. Scott related that Williams lived alone and had no particular friends or acquaintances. She also revealed that he used daily medication for pain relief and wore an elastic stocking to support his leg that was plagued by varicose veins. Scott confirmed that Williams complained of his failing eye sight which often prevented him from doing his business. She also swore that none of Williams ailments were due to any "vicious habits." In spite of his faltering eyesight and declining health, Williams continued to illustrate as well as battle the government for a veteran's pension which was finally awarded in November 1895 at a rate of $8 a month--equivalent to approximately $153 in year 2000. Williams place of employment on official documents continued to be listed as either Rand McNally Company or Werner Company at 160 Adams Street in Chicago. During the summer of 1897 Williams built a cabin retreat for himself near his old hometown of Watertown, New York in the Adirondack Mountains near a site called Star Lake. According to Williams' niece Bertha, he never had a chance to occupy his cabin retreat which was still standing in the summer of 1938. Williams remained aligned with Belford until his death. The last works Williams was involved in illustrating were the lectures of John L. Stoddard which were copyrighted and published by Belford, Middlebrook and Company of Chicago. Williams was in the midst arranging the illustrations for the Stoddard project at the time of his death on November 23, 1897. Belford, Middlebrook and Company copyrighted the first four volumes of Lectures in 1897. After Williams' death, the remaining six volumes of lectures were copyrighted under the imprint of Balch Brothers of Boston in 1898. True Williams died at age fifty-eight. His death certificate states he was found dead at 43 Sheldon Street in the eleventh ward of Chicago on November 23, 1897. The coroner's report lists the cause of death as hemorrhage due to the rupture of an aortic aneurism [sic]. The Chicago Daily Tribune ran only a two-line announcement of Williams' death with the statement that the funeral would be private. Williams was survived by his mother Louisa Keelar Williams; his sister Rhoda Delana Williams Sherman; and his niece Bertha Sherman--all of Watertown, New York. Williams was buried in Hinsdale, Illinois in Torode cemetery alongside his wife Carrie and his infant son Truman Paul Williams. 1905 - Samuel Clemens (Mark Twain), on December 21, 1905, fondly remembered True Williams in a speech given before the Society of Illustrators Dinner, Aldine Association Club, in New York. Clemens, speaking of his early days at American Publishing Company stated, "That publisher of mine in Hartford had an eye for the pennies, and he saved them. He did not waste any on the illustrations. He had a very good artist-- Williams--who had never taken a lesson in drawing. Everything he did was original. The publisher hired the cheapest wood engraver he could find, and in my early books you can see a trace of that. You can see that if Williams had had a chance he would have made some very good pictures. He had a good heart and good intentions. "(30) There is no currently available evidence that indicates Sam Clemens was ever aware of Williams' alignment with Alexander Belford. In a personal interview and correspondence with Belford's granddaughter, she reports that her grandfather was never discussed within the family and that his grandchildren were never told anything related to their grandfather except that he had been a publisher who invented the paperback book. 1912 - Albert Bigelow Paine, Mark Twain's official biographer, wrote in Mark Twain's biography that True Williams was "a man of great talent--of fine imagination and sweetness of spirit--but it was necessary to lock him in a room when industry was required, with nothing more exciting than cold water as a beverage. "(32) Paine had apparently forgotten the days his own poetry and True Williams' book advertisements had appeared together in the pages of Belford's Magazine. 1921 - Rhoda Delana Williams Sherman died on November 23, 1921--the same day of the year that her brother True had died. Rhoda was eighty-five years old at the time of her death and was survived by her daughter Bertha. Rhoda was buried in the family cemetery plot at Brookside cemetery in Watertown, New York. 1926 - Marietta Holley died on March 1, 1926. Holley bequeathed her photos of True Williams to the Jefferson County Historical Society along with his letters and her copies of his autographed books. Five years later in 1931 the Watertown Daily Times published in serial format Marietta Holley's autobiography including her reminiscences of True Williams. 1949 - Bertha Sherman Rhines, True Williams' niece and closest surviving family member died on May 13, 1949, and was buried in Brookside cemetery in Watertown, New York. Among Bertha's possessions from True Williams' estate had been a signed note from Sam Clemens regarding the work Williams had done on Sketches, New and Old. Related resource: Chronology of books with True Williams' illustrations. (2) True Williams affidavit, National Archives file no. 898.293, Washington, D. C.
(3) Mark Twain's Letters, Volume 3: 1869, ed. Victor Fischer and Michael Frank, (Berkeley: University of California Press, 1992), p. 142. (4) True Williams to Marietta Holley, letter dated 2 June [no year], Watertown, New York, Jefferson County Historical Society. (5) Early Tales and Sketches, vol. 1, 1851-1864, ed. Edgar M. Branch and Robert H. Hirst, (Berkeley: University of California Press, 1979), pp. 649-650. (6) Nathan M.Wood, "True Williams, Pen Drew Literary Giant of Old," Watertown Daily Times, August 30, 1938, p. 11. (7) Samuel Clemens to Elisha Bliss, 5 November , reprinted in Mark Twain's Letters to his Publishers 1867-1894, p. 92. (8) Mark Twain-Howells Letters, edited by Henry Nash Smith and William M. Gibson, (Cambridge: Belknap Press, 1960), p. 121. (9) Mark Twain's Satires & Burlesques, ed. Franklin R. Rogers, (Berkeley: University of Califonia Press, 1967), p. 287. (10) Gordon Roper, "Mark Twain and His Canadian Publishers," American Book Collector, June 1960, p. 20. (11) Samuel Clemens to Williams Dean Howells, 5 December, 1876, Mark Twain-Howells Letters, p. 167. (13) Helen Rich, "The New Book By Miss Holley," The Woman's Journal: Boston, 22 June 1878, p. 197. (15) Samuel Clemens to William Dean Howells, 5 March 1880, Mark Twain-Howells Letters, p. 290. (16) True Williams to Marietta Holley, letter dated 2 June [no year], Watertown, New York, Jefferson County Historical Society. (18) Merle Johnson, A Bibliography of the Works of Mark Twain, (New York: Harper Brothers, 1935), p. 155. (19) Janice A. Patterchak, Mapping a Life's Journey, The Legacy of Andrew McNally III, (Rand, McNally and Company, 1995), pp. 1-10. (20) Court records for Samuel L. Clemens v. Belford, Clarke and Company, Circuit Court, Northern District of Illinois, September 30, 1882 - January 20, 1883, National Archives - Great Lakes Region, Chicago, Illinois, no. 625. (21) George H. Doran, Chronicles of Barabbas, 1884-1934, (New York: Harcourt, Brace and Company, 1935), p. 97. (22) Raymond Howard Shove, Cheap Book Production In The United States, 1870 to 1891, (Urbana: University of Illinois, 1937), p. 82. (23) "Mark Twain and His Book." New York Times, 10 December 1889. (24) Donn Piatt to Samuel Clemens, 5 January 1889, Mark Twain Papers, University of California, Berkeley. (25) "Cheap Books, But Not Too Cheap. Inside Views of the Reprinting Trade and What Reprinting Means. Literary Piracy Unprofitable. The Advisability of a Book Trust An Open Question With the Men Most Interested," New York Herald, July 7, 1889, p. 21. (26) Bessie Louise Pierce, A History of Chicago, Volume III: The Rise of a Modern City 1871-1893, (New York: Alfred A. Knopf, 1957), p. 169. (27) Typescript from Chicago Historical Society titled "Belford, Alexander," Chicago Record-Herald, September 4, 1906. (28) Paul Kruse, The Story of the Encyclopaedia Britannica, 1768 - 1943, (Chicago: University of Chicago, 1958), p. 206. (29) National Archives file no. 898.293. (30) Paul Fatout, Mark Twain Speaking, (University of Iowa Press, 1978), p. 474. (31) "Alexander Belford," Publishers' Weekly, October 20, 1906, p. 1099. (32) Albert Bigelow Paine, Mark Twain, A Biography, Vol. I, (New York: Harper and Brothers), p. 366.